I am sitting in the waiting room at the new building waiting to be called. I have cleared all my test, given a briefing by the research nurse, and my port is accessed. Today is my first day to received a new clinical trial drug; an immuno-therapy treatment. Needless to say I am anxious since this is new. The nurse order anti-nausea drugs and skin rash drugs. I was told to expect some skin problems like acne (OMG, acne at my age. Oh well…). Bring it on. Today is the chemo drug, tomorrow is the immune boosting drug. I am already thankful I got this far and entered into this new cutting edge trial. I try not to put too much expectation on this, after all this is a clinical trial. We will not know unless we try. Such is the life of a gerbil on wheels. It is a matter of believing. We are back from our trip and I am back at University of Chicago hospital for tests: CT scan, blood test, and EKG. These test are needed for me to start the new critical trial on Monday, March 30. It will establish a baseline for me before I start the trial, a new immuno-therapy trial. New trial, new hope. That is all I can ask for: hope that this next treatment works. The optimistic way is to say; I believe this next treatment is going to work. After all it is a matter of believing. Back in Jerusalem and Rome, there is a lot of that — believing. 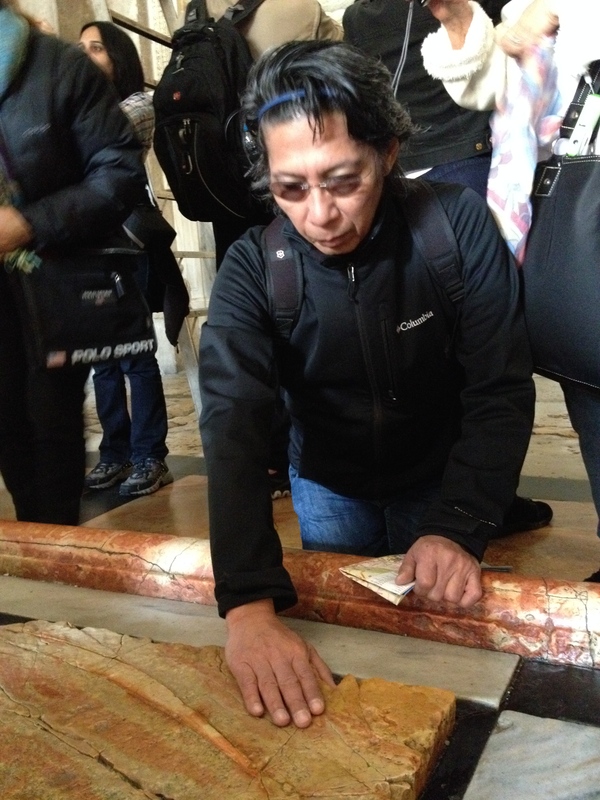 At the Church of the Holy Sepulcher, I placed my hands on the stone where Jesus was said to have laid after being brought down from the cross. Is that really the stone? Similarly, Golgotha, the biblical name where Jesus was crucified, has three locations depending on which you believe is the true site. Most believe that the true site is where the Holy Sepulcher church lies, and that is where most people flock and worship. It is a matter of believing. In Rome, where the city is replete with history and artifacts even before the time of Jesus, you need every ounce of belief to accept all the things you see. It was mind boggling. I was in awe of the magnificence of St. Peter’s Basilica. I experienced hair-raising moments when I saw the Pope, attended mass at the Basilica, viewed the Sistine Chapel, and when I climbed the Scala Santa on my knees. All the sights, statues, obelisks, churches, etc., tells the story of man’s tribute to God and his belief. There is not enough buildings and basilicas to compensate man’s insecurities in his quest for perfection as reflected in the beautiful artworks and paintings. I carry the same inadequacy, that’s why I pray. Right now I pray, not for lofty offerings or perfection, but the courage to fully believe I will be cured. It is a matter of believing. Now, let see what my doctors will tell me. P.S. I gave my Jerusalem medal to my friend and PT, JamieM. I told her she deserve the medal for helping me get back, while I got the memory of running Jerusalem. Then she asks “so what’s next?” Huh? This is my first time to Rome but not to Italy. They call it the Eternal City because there is so much history behind it. It was the center of the western civilization and at its peak the Roman empire conquered most of Europe. At that time, it is either you are a Roman or a Greek or a barbarian. The rise and fall of the Roman empire is well documented and this city has all the evidence of its glory and scars of its past as well. I came to Rome to continue my spiritual journey and I was not disappointed. Upon arriving, our hotel managed to get us tickets to the Papal Audience ahead of time. So I was very excited. Every Wednesday is the Papal Audience held at St. Peter’s Square. The morning we attended there were several thousands of people gathered at the square. The mood was festive. There were country flags, welcome banners, kids on tour, and many pilgrims. Before the Pope arrive, they announced all the groups present or were represented in the audience. There were schools and religious groups from all over the world, and each time when their name was called they cheered. We sat among high schoolers from Toronto, Canada led by their teacher. At the appointed time the Pope came out riding in his Pope-mobile. The crowd surged and stood on their chairs to get a glimpse of him. I was among them. Then, I saw him and felt a surge of excitement. Wow. I felt like a teenager seeing my idol and I was on the verge of tears. I could not believe I am in the presence of the Pope. Everybody was reaching out to him. He would stop and his security would bring babies or kids to be blessed or kissed. His path was lined with kids and adults on wheelchairs, all seeking for blessing. I am among those seeking his blessings. I asked for guidance and strength to face all my challenges. Seeing him gave me comfort. It was an unbelievable experience. I was mesmerized in his presence. He message was about the importance of family. At the end, he led the prayer for the Our Father (Pater Noster) prayer in Latin. Rome is full of Christian monuments and statues. They all reflect tributes of greatness or adoration to God. There are churches, castles, and symbols that some how relate to a higher being one way or another. They show the dedication of man to his God. The statues of saints and angels provide a way to relate our true feelings and confess our inner doubts. Being among these beautiful masterpieces has given me a way to reflect and appreciate all the blessings I have. It can be overwhelming. God is everywhere. That is what I remember what my grade school religion teacher told me. God is here. 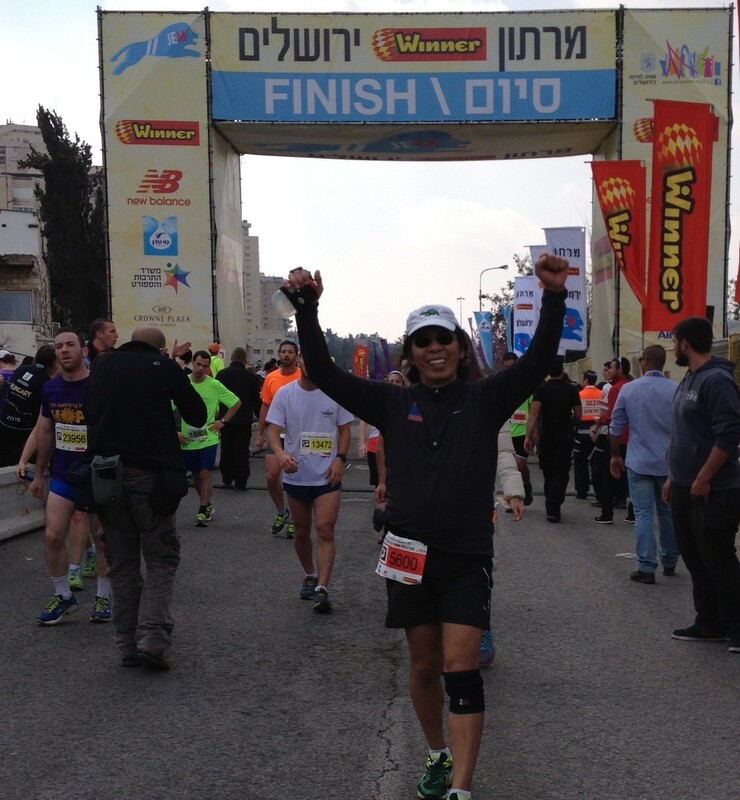 God helped me cross the finish line during the Jerusalem half-marathon. He was also watching if I cheated during the race …hehe. During the race there were lots of opportunities to cheat, cut corners, or plain just give up. There were stretches along the course where you can just make a quick turn and nobody would know. I know I will not win it anyway so why bother. Beside I have I every bit of good reason not to be at the starting line: I have metastatic cancer in my lungs. But I was not going to be robbed of this opportunity. I am hoping in between the pain of running the hilly terrain of Jerusalem and the solitude it brings, I find peace. Magnificence of this place is striking. The history and the scenic view the city provided was inspiring. The pavement on the course might have been man-made but this is God’s land, therefore holy. There were olive trees, which made me wonder how old they were? Were they around during the time of Christ? Are there olives in Mt. Olives? Perhaps there is something in running that enhances your senses to absorb your pain in your body, the loud cheers of the crowd, and appreciate the beauty of Jerusalem. You notice everything and I could not help but appreciate the significance of this place. I am blessed. Catharsis, a purification or purgation of emotions that brings about spiritual renewal or tension – Merriam/Webster dictionary. 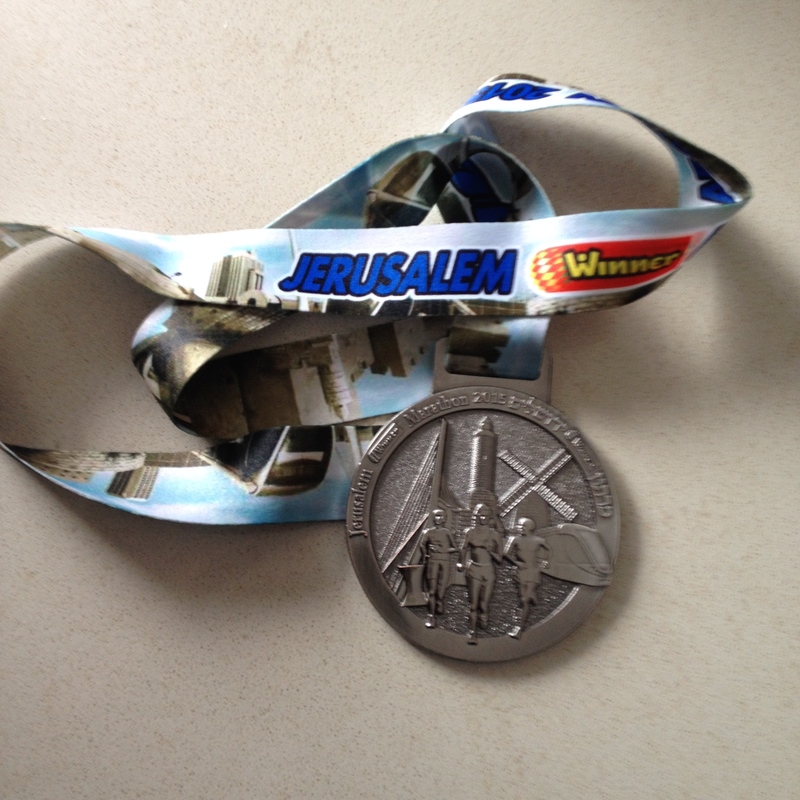 This is my Jerusalem marathon: a cathartic moment. After my 13.1 mile cleansing, my wife and I got to see the preparation for Shabbat. The hostel were we stayed hosted a Shabbat dinner serving a full vegetarian meal (I can live here). Guest pay for the meal but if you want help out in the kitchen, like cut vegetables, you get a free meal too. It is not the traditional Shabbat meal prepared at home with fancy silverware and mapah levanah (white table clothes), but the essence of the meal is there. There is the Shabbat candles, Shabbat challah (whole-wheat bread), wine, prachim (flowers), etc. I am sure the food taste good too as well as company of fellow travelers in the table. There is something to be said about food in this place. It was as if all the fruits, vegetables, and food were touch or made by God himself. The oranges from Jaffa, even bottled ones, taste sweeter. The olives were plump and tasty, perhaps picked from hundred year old trees in the surrounding area. I could go on and list all the typical Israeli food that I tasted which was influenced by many cultures when this country was formed. These are the tahina, hummus, falafel, salad, halva, kebab, and many more. I love it. A trip to the Mahena Yehuda market is an experience that cannot be miss, especially on a Friday. It is were the locals shop for their daily needs. Going there is an assault to your all senses. Amazing place to explore, taste, and learn. I am definitely not in Chicago. This early I know I am going to miss this place. The Old City is about one square mile and it is densely packed with more than 45,000 residents that includes Jews, Muslim, and Christians. There are churches, museums, schools, apartments, markets, toilets, eateries, etc., and history. The city is divided into four quarters: Armenian, Jews, Arabs, and Christians. I came to walk the Via Dolorosa and it is more than I bargained for. The narrow streets were full of merchants selling their wares from fruit juices to pots and pans. If you can think of anything that you would need on a daily basis it is there. The air is punctuated with all sorts of perfume, scents, spices, and vendors calling your attention. It is hard to imagine these are the steps (the Via Dolorosa) that Jesus took on the way to Calgary or Golgotha. The path of the Via Dolorosa ends at the Church of the Holy Sepulchre, the place according to Christians is where Christ was crucified, died,and was buried. There are many artifacts on display in the church but the most electrifying object for me was the stone where it is believe where Jesus laid and cleaned after he was brought done from the cross. I touched the stone much like all the visitors coming and felt something inside me. The stone was cold to touch but it pulsated and gave me warmth. What was it telling me? In Jerusalem I was hoping for answers and peace. I saw and absorbed all the sights and sound of Jerusalem. I indulged in the experience. I prayed to all the Gods (Jewish, Orthodox, Christians, Jesus) and went to all the religious sites, including at the Western Wall. I contemplated. I ran its streets. I swam in the Dead Sea. Met many travelers who come to this place seeking whatever they seek. At the end, it is left to me, and those who came here. It is about believing. And in this place it is not hard to believe. P.S. We are at the airport now on the way to Rome. The next leg of our adventure. Hopefully, I get tickets to see the Pope tomorrow. I finished the Jerusalem Half. short note since many wanted to know how I did. It was painful, very hilly, memorable, and most exhilarating experience of my life. My time was 3:16:45 and each moment was worth it. I struggled especially on last three miles, which was mostly uphill, but I did it. I am happy with the time and I thought it was good considering my condition, training, and terrain. I had to abandon my run/walk strategy because it was not working. Instead, I took what was given: run the downhill and flats, then walk the uphill climb. Dig deep and enjoy the pain and suffering. L’Chaim. Tonight is Shabbat. The markets are full and all the Jewish families prepare a special meal, then a day of rest. It is a celebration of life by the food taken in order to nourish yourself. I am fully nourished, rest is what I need. I will write again. irst, a piece of good news from last week. I qualified for a new trial, an immunotherapy trial at that. Some how during the pre-qualifying EKG test for the PRI parameter was good, as well as my blood test. So I am in for now. The doctor explained to me how it works. This new trial involves two drugs: a chemotherapy agent that suppress the growth of tumor and an immunotherapy agent that boost my immune system at the cell level to attack cancer. Picture this: two wrestlers, one holding the cancer cell in a grapple hold and the other, pumped up with steroids, beating the sh*t out of the cancer. Hopefully, it works because the chemo drug to be used is for colon cancer, which fits my profile. I still have to do a final test (CT scan, EKG and blood work) again before starting the treatment which is scheduled on March 30 and 31. By then I have been weaned out of my previous trial drug and ready. I pray I pass. Speaking of prayers, what better place to pray than in Jerusalem and Rome. I leave for the Holy Land today and I have been looking forward to this trip. A new journey of self-discovery and prayers. I am also going there to run the Jerusalem half marathon on Friday, March 13. Am I ready? Hardly. This is one race I am full of anxiety. Since being “booted” out the trial, my mind has been filled with tumor growths, things to do, and ITB rehabs resulting in half-hearted training. My longest run so far was 8 miles on the Alter-G at 60% my full weight. Normally, you need to hit at least 10 miles with confidence for a decent 13.1 (21k) mile finish at full weight. We will see. I don’t do well with hills too and that’s Jerusalem for you. Full or half, marathons are unforgiving; like life. You take what is given and you just have to have absolute faith to carry you over. Faith is what I need. Peace of mind is what I seek. Prayer is my mantra. Lord, I am in your ‘hood. You have walked the well worn trails of Jerusalem and its country side, or perhaps have tried to out run your Roman captors. I have come far to run, pray, and seek peace within. If you are there, just carry me across the finish line this one last time. I carry a big burden in my chest much like the cross You carried on your shoulders. I asks you keep me safe so I bc can be with my family (for a while longer). P.S. JamieM (Novacare), this one is for you…and Alice the Alter-G. It is official: I am out. I am officially out of my current clinical trial because they have determined I am (again) no longer responding to the treatment. I have exceeded the growth threshold. Now, we look for another one that I can enter. Needless to say this journey is just frustrating. I have traveled far and long with this cancer. I have had victories and defeats, lately, it is more of the later. I will meet with my doctors again this week to discuss my other clinical trial option. We have stopped my treatments and will not expect to have one in the next four weeks. This is to wash out the trial drug in my system before entering a new trial. I should be rejoicing, especially since they are stopping my chemo. You have heard me say before: I hate chemo. Now it stopped it feels weird, awkward, like a break-up. What do you say after? It is as if somebody took my security blanket. I am lost. I am hanging untethered for the next four weeks. Hopefully, I find the answer in Jerusalem and Rome, if not peace.